It's still challenging to cook with a small child of 14 months. 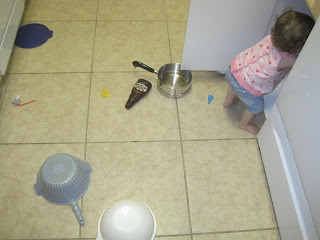 Tonight I found a compromise - let her pull everything out of one cupboard and then step lightly over the pots and pans. She then proceeded to get in and out of the cupboard. 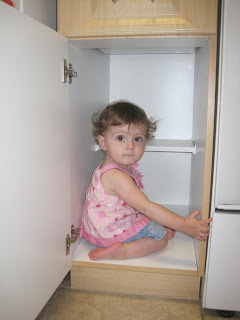 She obviously needs a cubby hole for herself. I'll get on it. 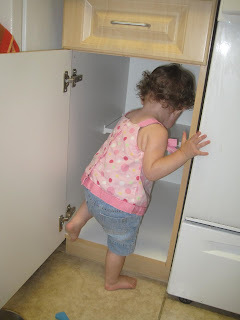 I have one particular cupboard I let my son rearrange on a regular basis - whatever lets me cook. Oooh, I remember the challenge of cooking with a 14-month-old. My son loved getting all the tupperware out of the bottom cabinets and spreading it all over the room. DROVE ME NUTS. He's over it now, thank God! Ooooh I was just thinking of the this too shall pass! No fair. When she is a teenager she will just call from another room to ask if dinner is ready. You will miss this phase.